Designed for both commercial and recreational, Sturdisteel picnic tables are engineered to withstand rigorous use for years of maintenance-free service. Designed for both commercial and recreational, Sturdisteel picnic tables are engineered to withstand rigorous use for years of maintenance-free service. These rugged picnic tables are the strongest, most durable offered anywhere, and are constructed of heavy-duty galvanized steel frames, with a choice of aluminum or treated tops and seats. 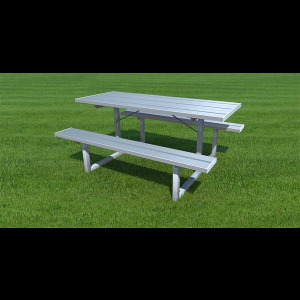 Picnic tables are ideal for all outdoor common areas, sports facilities, parks and recreation, and are aesthetically compatible with new or existing facilities.